Discover the Sweet Side of Camont! Imagine a Sweet Adventure at Camont for those that dream of sugar clouds; for those who make sure every decadent crumb is devoured; and especially for those who don’t mind a bit of flour dust in their hair (or is it fairy dust?). 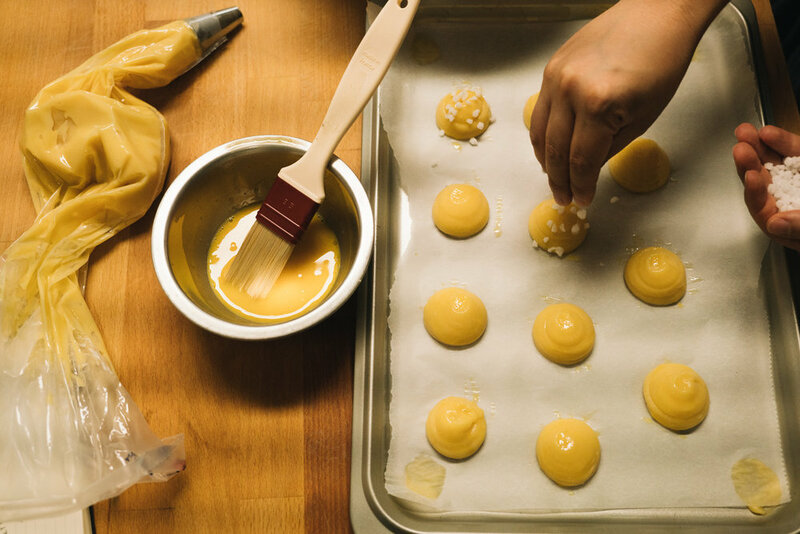 Escape to Gascony in Southwest France for a fabulous 2 or 5 day workshop of sweet fun learning to make some our favorite classic French pastries with Pastry Chef Molly Wilkinson. I call Molly the The Sugar Fairy and when she comes to Camont, everything gets a bit lighter, a bit sweeter, a bit more... fun! She bakes and tempts online at mollyjwilk.com. We will be baking in my restored 18th-century farmhouse Camont in both the original and the professional kitchens, and making use of the kitchen gardens, orchards, and edible flowers on the property. Small group of 6-8 only! Instruction is in English (although Molly and I both speak French) and is suitable for all levels (just bring your love of baking!). Guests stay in nearby accommodation in charming Nérac that we can help arrange- from village hotel to chateau to country home. Each person will leave with a Oui Sucre! market basket, including your own tools you'll need to make the recipes we learn over the weekend: your own a French rolling pin, piping tips and bags, a few surprises. Flour, sugar, fresh eggs, seasonal fruit, and an unlimited supply of butter are Molly's secret ingredients. Dive deep into the basics as we make fanciful sweet creations with delicious flavors, delicate colors, meringue accents, and of course, all that comes with decoration (aka gold luster dust!). Come join us for five days of pastry fun in Gascony. We’ll get busy in the kitchen learning all the basics you need to know to create beautiful desserts and travel around in the region! The itinerary will include a visit to the market at Nerac, a very cute town that Joanne Harris’ book Chocolat was written about, a demonstration at a local bakery on how to make a regional dessert-la Croustade Gasconne, and pastry instruction each day at Camont. We will use fresh eggs from the our own chickens, and flowers and herbs from the garden to decorate and infuse our creations. Each day Kate will be making a fabulous “School Lunch at Camont” and we’ll finish up the day about 5pm with tea or aperitifs giving you time to explore the region or just relax and eat sweet treats! Evenings are free to explore Nérac and the surrounding area, small cafés, wine bars, chateaux. Tuesday: We’ll meet at Camont to start our baking adventure with a lesson championing the fruit of the season, namely the many different varieties of strawberries from the farm nearby! In the morning we’ll start out with a classic Frasier Strawberry Tart. Everyone will learn to make a pâte sucrée tart crust by hand. Then we will whip up a stunning fragrant vanilla bean pastry cream to pipe inside, and layer fresh strawberries of several different varieties on top. In the afternoon, we’ll take what we learned one step further, each method builds on the next in easy increments, with a refresher on pastry cream so we really have it down. This time though, the flavor will be roasted strawberry, the perfect filling for our vanilla bean, Roasted Strawberry Mille Feuille. Each person will also master a puff pastry technique that is a complete game changer. Easy, quick, but with all the same layered buttery goodness of the classic version that takes hours, or even days to create. Wednesday: In the morning we’re off to a unique patisserie in a nearby village for a demonstration of a most famous regional dessert: the Gascon Croustade, a flaky buttery apple classic with that perfect amount of Armagnac! Here the dough is pulled into paper thin dough sheets on large tables- all by hand! On our way back to Camont we’ll stop by the apple orchard to pick up some different varieties to make a Classic French Apple Tart. We will add in an easy surprise twist though which makes this classic just that much better. The day will end with an apple tart tasting comparing the Gascon Croustade and our own creations. Thursday: Let them eat cake! It’s tea time at Kate’s with little treats like Madeleines, Financiers (or friands), chocolate mousse, strawberry cakes and more! The perfect little treats that are impressive and beautiful, but also easy to do. We’ll learn fresh floral decoration techniques, and how you can take these treats to the next level! Friday: Today we are diving into choux—both savory and sweet with chouquettes with big hunks of pearl sugar, gougères using cheese from the market, and light, melt in your mouth cream puffs! A bit like what I would assume eating sugar clouds would be like. For the fillings, we’ll learn chantilly cream, and play around with fun flavors like blackberry-thyme and lemon basil-lavender in infused creams, curds, and coulis. Choux are the basis of many French desserts like éclairs, St.Honoré, profiteroles. Saturday: The colorful Farmer's Market in Nerac is the place to shop, gossip, and meet Léon who makes the most amazing cannéles ever! We’ll pick up Spring produce for the quintessential French farmer’s lunch- including fresh baguettes, cheese, olives, oh and so much more. Then in the afternoon, after a glass of chilled rosé (or two) we’ll make French Macarons together- going over the different techniques and two filling possibilities. Everyone will have a box of macarons to pop into their bag of goodies to take home as we bid everyone au revoir! Molly will be teaching you step by step and filling your apron pockets with tried and true recipes. The focus is on non-fussy, beautiful French pastries that are fun to make and even better to eat. We will be allowing plenty of time for decoration and techniques to add those special finishing touches that take your creation to "Oh la la" land. Does not include: overnight accommodation, other meals, personal expenses and travel. Molly Wilkinson is a Le Cordon Bleu Paris trained pastry chef, who has honed her skills in several different bakeries in the US and France, including Bisous Bisous Patisserie in Dallas, voted the best bakery in Dallas the year it opened, and at the Château de Gudanes in Southwest France. Molly lives in Strasbourg where sweets are queen and she come to Gascony to share her expert hand with us several times a year. Having made tens of thousands of macarons and tons of light as air pâte a choux, Molly is an expert and patient teacher as well as a lot of fun. Now you can join Molly in the Kitchen at Camont and bake the French days away together. Click here to sign up! More Pictures ny Jamie Beck here!